Good news, BitFund.cash BETA launched! The 'Self-Hosted Fundraisers' Showcase! ATTENTION: Already launched a fundraiser? Submit your fundraiser in the comments below, as well as any tasks you'd like to include. 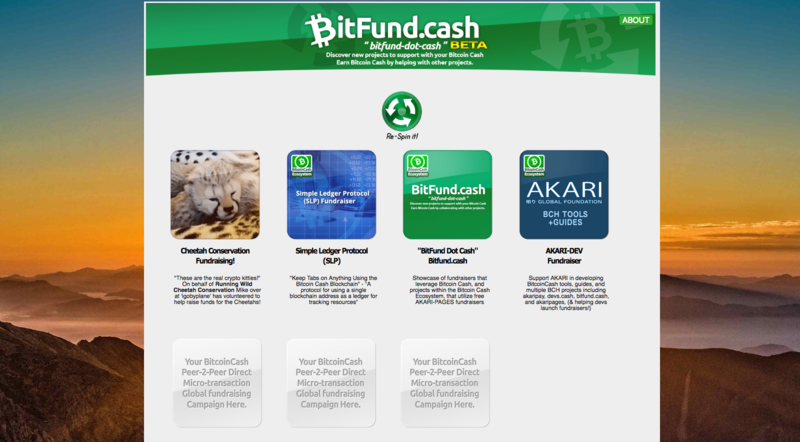 Bitfund.cash "bitfund dot cash" highlights/showcases funds launched using AKARI-PAGES (or akaripay) that accept Bitcoin Cash. Once an initiative sets up their self-hosted AKARI-PAGES fundraiser page, we include it for free on the BitFund.Cash website. Supporters can also earn Bitcoin Cash by helping raise awareness for fundraisers (and help with other tasks (coming soon))! Since you own and maintain your fundraiser completely, including setting goal-levels and details, we do not skim or take any percentage away from the funds you raise. AKARI-PAGES is a completely free, open-source, self-hosted Bitcoin Cash fundraiser tool that also functions on github.io/bitbucket.io pages (or your own web-host)- making it 100% free to use + 100% free to get your funds! There are no withdraw fees, all funds go directly to your wallet. The tool is mobile-friendly, increasing the donations you receive by making the donation page easy to view on every mobile device and desktop computer. Your page is highly-customizable through simple text file editing. Start yours by viewing the guide on the BitFund.cash website. AKARI+BitFund.Cash DO NOT take any percentage from your crowd-fundraisers, it is direct, Peer-2-Peer, and completely free. You own your fundraiser, set your own goal-levels, and make it completely yours. Why are we doing this? We believe that helping new crowdfunding projects grow and launch will increase the network effect for Bitcoin Cash and benefit everyone. We also believe that helping new crowdfunding projects (especially non-profit initiatives) is for a very good cause, an example is the Cheetah initiative that was the first one started. If you have a great idea for a tool that can help the Bitcoin Cash ecosystem, start a fund to help development! If you're already in development, start a fundraiser to help boost and pay for your work or your teams work. No matter where you are, as long as you have internet, you can start something new using Bitcoin Cash, and we want to help you do that. Check out the BitFund.Cash BETA website, and let us know what you think! Are you a Bitcoin Cash Crowdfunder already using AKARI-PAGES? 1. Submit your Testing & QA task to "BitFund Dot Cash" by leaving a reply in the comments below. 2. Submit your "Help with Awareness Offer" by leaving a reply in the comments below. Just want to say great job, and thank you! great work, is this similiar to lighthouse btw? Thanks! It is quire different to lighthouse but not necessarily better or worse, in that it highlights more open-ended (no time limit) goal (and level) oriented fundraising and it is self-hosted, so it isn't really a platform with pledges or revoking pledges, it's much more like a simple showcase or directory. That does mean there is some extra effort to get a fundraiser page set up, but we've tried to make it as easy as possible to get started, all setup is done by uploading the tool and editing some text files.